While pet lovers around the world take pride in their pets good looks, there are a handful of pet owners that take pride in how ugly their dog is. These ugly pooches compete each year in the San Francisco Bay Area's World's Ugliest Dog competition to find out how is the ugliest of them all. The abnormally unique dogs strolled down a red carpet lined with a panel of judges who will take in all of the grossest features of the competitors in an attempt to find a winner. If your dog is chosen as the winner, you can take home a grand prize of $1,500. 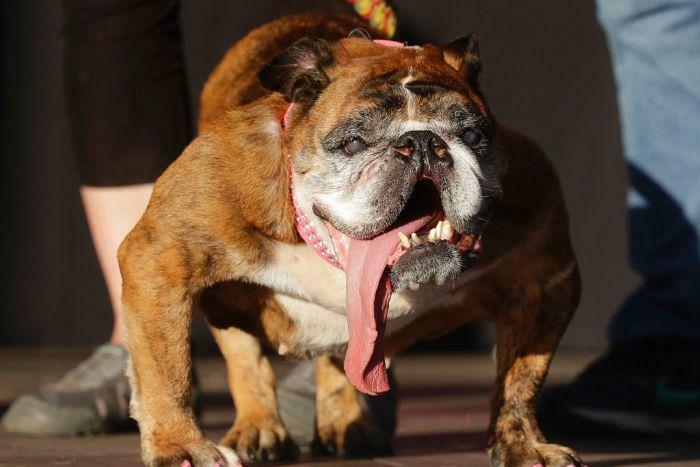 The winner of this year's World's Ugliest Dog competition is a bulldog named Zsa Zsa. Zsa Zsa and his owner, Megan Brainard of Anoka, Minnesota, competed against dogs of all shapes and sizes both with and without hair. The contest was held at the Sonoma-Marin Fairgrounds in Petaluma. This year's contestants included a blackhead-covered Chinese Crested-Dachshund mutt and a bulldog mix with a ridiculous amount of excess skin. The winner of the World's Ugliest Dog competition last year was a 57-kilogram giant of a pooch named Martha. The gentle giant was a Neopolitan mastiff with a case of bad gas and a drooping face. While she competed, Martha would often drop down on her side with her droop face spread across the ground to show off her unique appearance. …and the winner is, a Democrat!